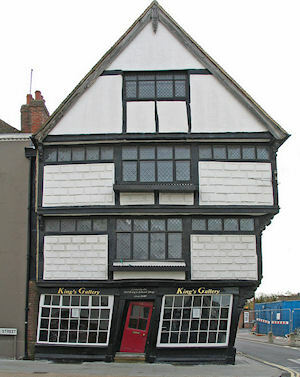 Sir John Boys House, also known as The Crooked House, is a skewed 17th century half-timbered building located at the extreme end of Palace Street in Canterbury, Kent, England. The most noticeable feature is the front door, which leans at an exaggerated angle and was built with severely skewed corners to fit the door frame. The house started to lean as a result of alterations to an internal chimney causing the structure to move sideways. Over the years the lean intensified and the chimney collapsed in 1988. The building is now supported internally by a steel frame, which prevents it from further movement.